Sales of tablets, Chromebooks, and other mobile personal computers in the U.S. K-12 Market jumped by 10 percent in the first quarter of 2018 compared with the same quarter last year, as district buyers seek to replace and upgrade their pools of devices, a new analysis says. The rise in device shipments signals strong demand from the school sector for the rest of the year, predicts Futuresource Consulting, a British research and consulting organization, which released its forecast on Tuesday. 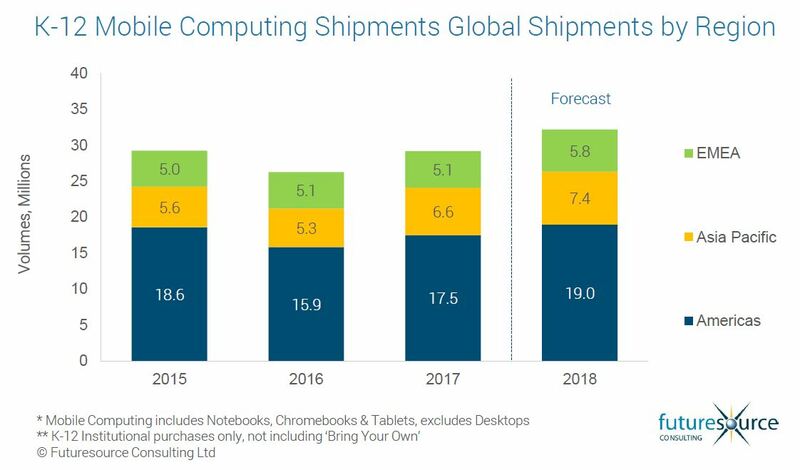 Over the past few years, Chromebooks—low-cost devices that run on Google’s Chrome operating systems—have taken up a dominant share in the U.S. market, outpacing sales of Apple and Microsoft, data from Futuresource Consulting show. In its new analysis, FutureSource Consulting predicts that with Apple and Microsoft placing an emphasis on devices priced at under $300—among other new products entering the market—the battle for K-12 buyers looking for affordable devices will intensify. EdWeek Market Brief examined the competition among Apple, Google, and Microsoft, as well as the rise of Amazon in the K-12 market, last year in a story and nationally representative survey of educators. “As the mobile PC market continues to grow, the competition between these major platforms and device[s]…is expected to intensify, creating challenges and opportunities for suppliers across the ed-tech landscape,” said the analysis from Futuresource Consulting. In the United States, schools are entering a “refresh cycle” in buying mobile personal computers, said Ben Davis of Futuresource Consulting, in an e-mail. That demand has pushed deals earlier in the year, as districts plan to deploy devices over the summer, he explained. Globally, shipments of mobile personal computers in the school space rose by 4 percent in the first quarter, year-over-year, compared with 2017. If the U.S. market is excluded, global K-12 sales rose just .23 percent over the previous year. Futuresource Consulting predicts robust growth internationally throughout the rest of the year, however. The growth will be pushed by large-scale K-12 computing projects across several global regions, with expansions in demand in markets such as Egypt, Uruguay, and Venezuela. Specific global regions saw growth in K-12 demand, including the Asia-Pacific region, at 13 percent growth year-over-year. The markets for K-12 personal computers also expanded in India and South Korea, Futuresource Consulting said. And in Europe, demand for mobile devices in schools soared by 14 percent in the first quarter, compared with the previous year, lifted by buying in France, Spain, and other markets. In terms of the market for operating systems in K-12, Chromebooks continue to dominate the market, Futuresource found: They made up 56 percent of the devices shipped in the first quarter of 2018. The growth trajectory of Chromebooks in the U.S., however, has slowed over the past year, as many districts are entering a cycle for replacing their devices, the analysis says. At the same time, Chromebooks have made gains in some international markets, such as Canada and northern Europe, said Futuresource. Globally, Microsoft Windows operating systems continue to lead the market, making up 44 percent of the international market. Futuresource Consulting collects its information from a variety of primary sources throughout the supply chain, said Davis, as well as from government entities in various markets.